The world renown overdrive terminator clutch system! 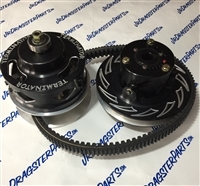 If you want a reliable, consistent working clutch, look no further! 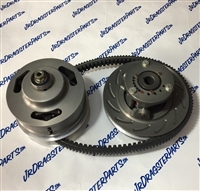 This 6" overdrive clutch comes with everything you need to bolt on and go! Call to give us your preferred specs! If you are looking for the baddest clutch on the market, here is where you'll find it. This clutch is specially machined to look great and produce maximum performance! It features detailed cover machine work and black anodizing. The secondary features a back shift helix made for the most consistency you can get out of a secondary. This is also a great system for 330 outlaw application. Call to give us your preferred specs! Top of the line polar clutch by Choo Choo set to your specs! Comes with JDP O/D belt. Call to give us specs. Full Choo Choo outlaw clutch package for those who want top of the line performance! Comes with two belts and two helix's. Helix's are also available here for fine tuning your setup!